The past two years Alex and I have taken the long Thanksgiving weekend to #optoutside and spend some quality time in the national parks. Finding places to go in November that aren't too cold or too snowy can be a challenge but we've found that Utah is a pretty good bet. Last year we hiked in Zion and Bryce Canyon national parks, but this year I wanted something a little more remote. After some research I discovered the Paria Canyon. The hike through the canyon doesn't follow a trail, instead hikers follow the river for 38 miles. The BLM only allows 20 people to enter the canyon for an overnight hike each day to preserve the delicate ecosystem of the canyon and to preserve the true wilderness feeling. It sounded like exactly what I was looking for so I reserved a permit and we booked our flights to Las Vegas! This hike requires the use of two cars or a shuttle service. Since we were flying into Vegas and then driving 4 hours to the trailhead it wasn't going to be realistic to rent two cars so we used Seeking Treasure Adventures and I could not have been more impressed with the shuttle service. Days before the owner, Yermo, met us at the trailhead, he picked up our permits from the ranger station and he picked up fuel for our camp stove since we couldn't fly with it. Those deeds alone would have been enough to warrant him a 10/10 but he brought us turkey for our Thanksgiving meal in the backcountry! When the day of the hike finally arrived we drove our rental car to the Lee's Ferry Trailhead, the ending point of our hike and met Yermo there. He then drove us 1.5 hours to the White House Trailhead and dropped us off. Despite it being Thanksgiving day he let us stop at some overlooks on the way to the trailhead and spent extra time telling us all sorts of interesting facts about the region. I can't recommend using Yermo's shuttle service enough! At the trailhead we rearranged our backpacks, used a real toilet one last time (if you consider a pit toilet a "real" toilet), and then headed for the Paria River, which would be our guide for the next 38 miles. We walked for about 20 minutes along the banks of the river before we were faced with our first river crossing. We anticipated the river crossings were going to be cold so we bought neoprene socks and wore trail running shoes that drained water, since the last thing you want on a cold hike is freezing water pooling in your boots! The first two days of the hike my feet were painfully cold, there were moments I wondered if this hike would be the end of a few of my toes, but thankfully all 10 of them survived just fine, albeit a little uncomfortable. The final day I decided to wear wool socks under my neoprene socks and my feet were significantly warmer. If you are thinking of doing this hike, I highly recommend adding wool socks to your layers! We began our hike around noon but the short fall days meant that the sun traversed the sky at a low angle. We knew we would only have a limited amount of time in the sunlight, especially since the towering canyon walls allowed very little light to reach the ground, so we planned on stopping as few times as possible. This proved difficult since every time we rounded a bend in the river we were graced with more stunning scenery, but we tried to keep pace as best we could, crossing back and forth across the river. Most of the first day was spent hiking through a portion of the canyon known as the Paria Narrows. This section is reminiscent of the Zion Narrows but with zero people; we often commented on how we couldn't believe we had the canyon to ourselves! This part of the hike was the coldest. Without the sun to warm us, I put on my fleece and down jackets, but I could still feel a slight chill in my bones. My toes were also painfully cold and I was longing to set up camp, but the nature of the Narrows meant that there were very few camping options until we reached the confluence of the Paria Narrows and Buckskin Gulch at mile 7. We doubled down on our efforts to make it to the confluence. As the sun sank even lower in the sky and shadows fell across the canyon walls we passed Sliding Rock Arch which indicated we only had 0.3 miles to go until we reached the confluence. This gave us a needed morale boost! As we were setting up camp a solo hiker passed by, heading back to the trailhead. He ended up being the only person we would see for the duration of our time in the canyon. By the time we set up camp and began to make dinner the sun had set and we were forced to eat by the light of our headlamps. After dinner we retired to the tent and, exhausted, passed out before 6:00pm. The next morning we allowed ourselves to sleep in. After a couple of jam-packed, sleep-deprived days it felt like a luxury. We made oatmeal and enjoyed a warm breakfast. Our second day was scheduled to be 13 miles and with limited daylight we didn't want to linger much longer at camp. We packed up and changed back into our hiking gear. We had left our neoprene socks and shoes out overnight in hopes that they would dry but they just froze solid. We breathed warm air into them until they were malleable enough to put on. Our poor feet, that had grown so dry and cozy overnight, were shoved back into cold, stiff socks and then plunged into the river. Our second day was spent hiking through more narrow sections of the canyon, the walls closing in on each other and towering hundreds of feet above us at points. The scale of the canyon was hard to grasp and even harder to capture in photographs, but that didn't stop us from trying! We hiked all day, trying to minimize the miles we would have to hike on day 3 and 4, but then Alex and I hit an obstacle: quicksand. I got stuck in it. We had known that quicksand was present in the canyon and we had walked through a few "quickie" sections of sand where our feet felt suctioned in, but that was nothing compared to the sand I got stuck in. We encountered various types of sediment under the flowing water: rocks, gritty sand, and soft sand that eats your feet. I was crossing the river when suddenly my right leg sank up to my knee in that soft, feet-eating sand, I tried to take another step and immediately found myself waist-deep in water, and sinking. It happened so fast I only have memories of being above the water and then a split-second later being waist-deep in water. I tried to pull myself out but the struggling made me sink further. My camera was around my neck and dangling dangerously close to the water, I struggled to get my camera off and hand it to Alex who walked it to dry ground. Now that my camera was out of harm's way I had a few moments to collect my thoughts. It was then I remembered reading a sign at the trailhead that noted if you get stuck in quicksand you should immediately take off your pack and throw it to shore, since that extra 45 lbs. is a pulling you down and making it even more difficult to muscle your way out. I took off my pack and handed that to Alex as well and was then able to use trekking poles to pull myself out. However, getting out was only the first obstacle, now I was soaking wet, the sun was setting, and the temperature was dropping. That is a recipe for hypothermia so we made it a priority to make camp as soon as possible so I could get out of my wet clothes and into my sleeping bag. We stopped at the next established campsite, which happened to be at mile 20. Despite the quicksand we had made it to our goal! I quickly changed into warm clothes and we ate dinner, this time without using a headlamp! Once again we turned in early and slept through the night. We set an alarm for the third day to get the earliest start possible. We also tried a new approach to thawing our frozen socks and shoes: we boiled water and poured it in our socks and shoes, this was (obviously) a much better solution than breathing into them! One important thing to note about the canyon is that while there are no designated campsites there are established campsites that hikers are expected to use. These campsites are usually on elevated benches above the river and are pretty obvious because a social trail will lead up from the river bank into a green area. The third day was planned to be about 10 miles, but we decided to throw the plan to the wind and make it out of the canyon a day early. We did this because we wanted to see Horseshoe Bend at night, which in retrospect was surely not worth the whopping 18 mile hike out. Once again we tried to minimize our stops in order to make as much ground as possible. Hiking faster was easier on the third day because the canyon finally opened up and we were able to complete long stretches without any river crossings. Our toes and feet rejoiced! The landscape and views this day were significantly different than the previous two days. In the narrows we could only see a few hundred feet in front of us and every river bend was a surprise, but on the third day we were able to see much further. I thought I was going to enjoy the views in the narrows more but I actually enjoyed being able to see the wider landscapes! This day also had the hardest river crossings. A huge portion of the river bed in this section is surrounded by boulders, which can be difficult to navigate around. The river was also the strongest in this section, which made river crossings more dangerous. Prior to this section the river barely went further than knee-deep, but here the river often was waist-deep and deeper! As we were hiking along the shore of a particularly long stretch of the river bed movement caught my eye. I looked to my left and to my dismay, saw a huge chunk of rock falling from the canyon wall, I called out to Alex so he could see it as well. The rock hit the ground with a loud crack that reverberated through the canyon. Moments later another piece of rock broke off from the same area and hit the ground with another thunderous crack. 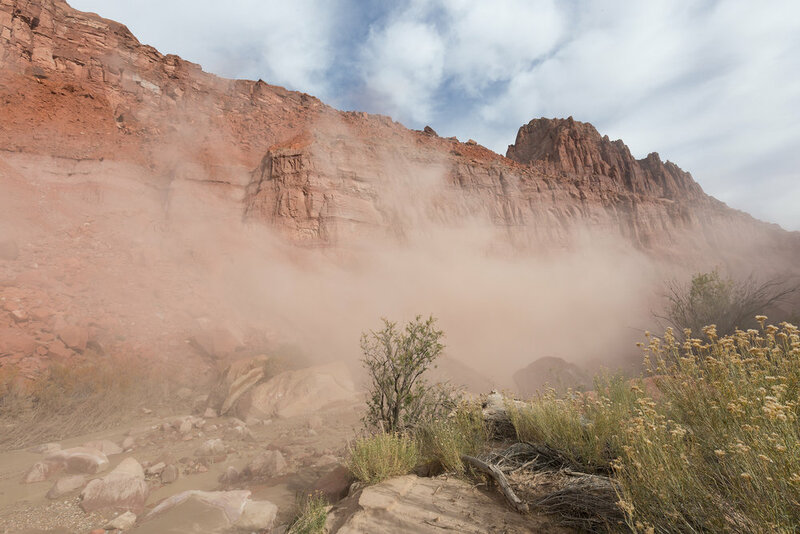 A huge cloud of sediment and dust began to billow up from where it fell (the lower-right photo in the grid above shows the new, exposed rock at the top of the canyon). The dust was soon surrounding us! It was another eye-opening example of how Mother Nature is beautiful, but Mother Nature doesn't give a damn about us. We continued onwards, past the last campsite, and the decision was final: we were going to make it out of the canyon on day 3, one full day ahead of schedule! Unfortunately, we weren't able to make it out of the canyon in daylight. We spent 2 full hours hiking in the pitch black, navigating river crossings and route-finding by the light of our headlamps. Our feet were in agony, both Alex and I bruised bones in our feet and by the time we made it to the trailhead we were limping. While I thoroughly enjoyed our time in the canyon I've never been so happy to reach the end of the hike. I do regret not taking the full 4 days/3 nights to complete this hike. It would have been so much more enjoyable had we had time to relax and not worry about muscling through miles. But, we did get to sleep in a comfortable hotel bed and take a steaming hot shower, and after a 38 mile hike that felt like heaven! 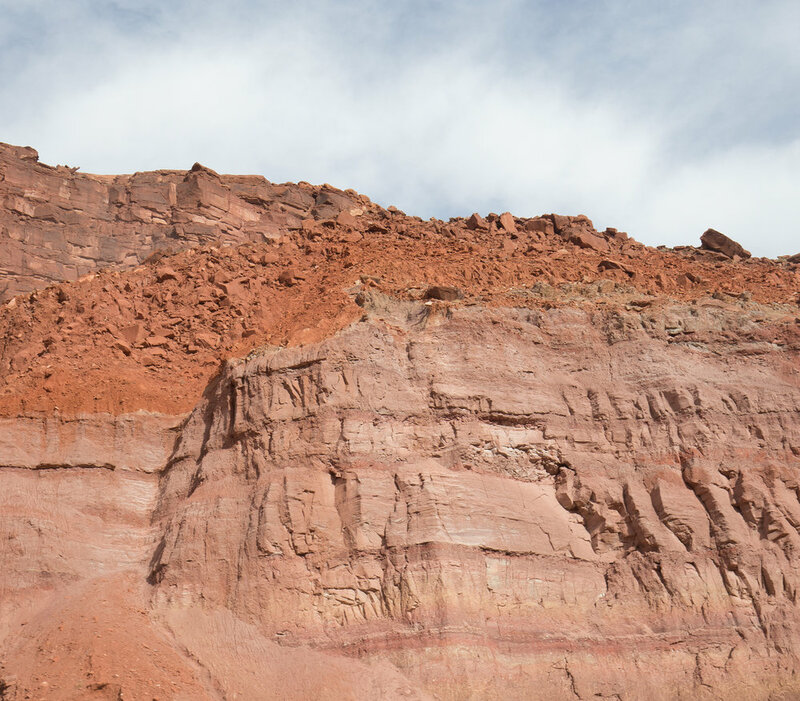 If you are interested in backpacking in Paria Canyon, check out my Adventure Guide HERE!